Shouldn't your pet have legal rights to emergency aid too? Until a new law was passed this spring, it was against the law in Ohio -- along with many other states -- for firefighters or paramedics to provide basic first aid to dogs and cats rescued from house fires, car accidents or other crisis situations. Only licensed veterinarians could do that.The legislation passed recently makes Ohio one of the first states to protect first responders who administer lifesaving aid to pets, companion animals or police dogs in crisis. Animal advocates say they hope the statute, which they liken to laws protecting good Samaritans who come to the aid of injured humans, removes hesitation for first responders who might have concerns about tending to injured pets. The law will allow first responders to, without fear of liability, provide oxygen, perform mouth-to-snout resuscitation, try to stem bleeding, bandage and even administer the overdose antidote naloxone to dogs or cats that have ingested opiates. Liability has been a concern because owners of pets have sued first responders who treated animals that ended up dying. "It's another layer of protection for the good guys," said Cory Smith, director of public policy for companion animals at The Humane Society of the United States. Ohio's law, which follows a similar action by Colorado in 2014, came about after Bob Swickard, the director of an EMS service in a small town in northeastern Ohio, contacted state Republican Rep. Tim Ginter with concerns about a recent rash of on-duty injuries to police dogs. In seeking guidance from a veterinarian on first aid for dogs, Swickard said he found "a missed loophole" -- it was clearly illegal for EMTs to treat animals. He and Ginter were especially concerned that paramedics couldn't administer naloxone to police dogs that came in contact with prescription pain pills or heroin. "There is the possibility that a dog could get a snout full of something and go down," Ginter said. "The best that they could do before this law was to call either a veterinarian to come to the scene or call for transport." Dr. Ed Cooper, head of emergency and critical care at Ohio State University's Veterinary Medical Center, said that as a result of the law, which takes effect Aug. 31, some veterinarians are reaching out to first responders to provide basic training, and first responders are beginning to seek it out. "The hope in having this law passed is really just to give first responders the opportunity and extend the option without the potential for recourse to assist pets as well as people in these kinds of crisis situations," Cooper said. "So (veterinarians) certainly see it as a positive thing." What the law doesn't do is require first responders to treat animals, nor does it now make it OK for people to call 911 when their pets get injured or sick. People should still call emergency animal hospitals in these situations. Smith noted that with two-thirds of American households having at least one pet, it stands to reason that first responders are going to encounter injured animals on the job. "Really, it's just about building humane communities," she said. "I think when first-response agencies and local governments and especially state governments plan around the fact that animals are such a huge part of our lives, it can only lead to good things." Are pets are getting a lot of "legal aid" attention these days! And it is exactly what we need to assure that pets can have the same chance of survival as we do. Well fire departments and ambulance services have hundreds, thousands of pets lovers, the system was not written to give aid to our pets. It is written, educated and made to serve human life. The Waldo Canyon fire that happened just outside of Colorado Springs became the most devastating wildfire in Colorado history. It was June 23rd, 2012. Everyone was in pain hearing of their disparity and many feeling as if there was nothing they could do. That was except for the pet community. Our friend Ricochet the Surf-ice Dog asked her social media friends to help us get Pet Oxygen Masks into Colorado and the response was overwhelming over. 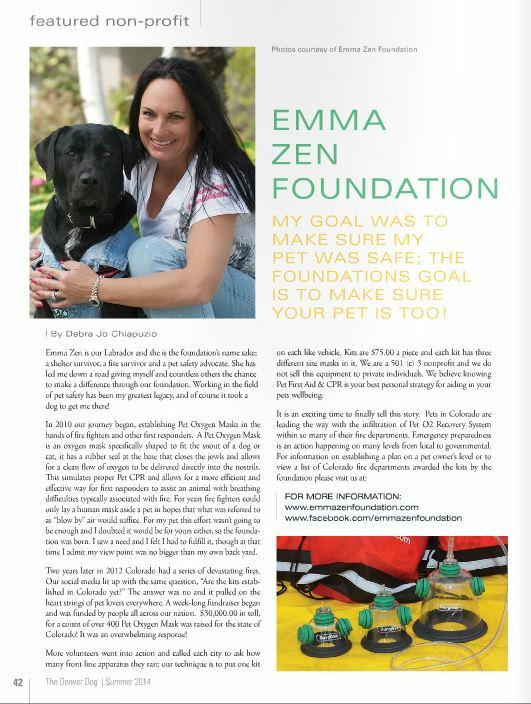 In all over 400 Pet Oxygen Mask kits made their way to Colorado Fire Departments by January of 2013. 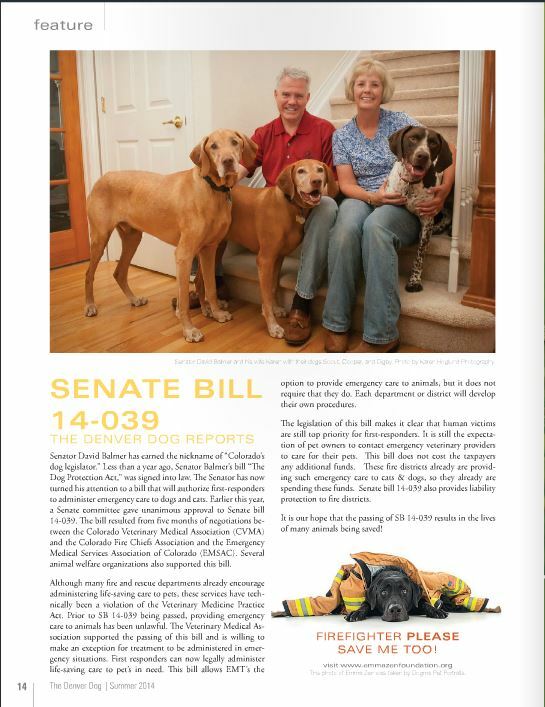 That same year Colorado State Senator David Balmer introduced Bill SB-039, which would allow Emergency Medical Services personnel the chance to opt into a pre-veterinarian emergency care services for pets. In other words those that signed up, would be additionally trained in Pet First Aid & CPR and would by law be required to administer care!!! This bill passed unanimously in March of 2014. The United States is slowly recognizing the role of pets play in our family unit. We have seen some Southern California fire departments offer triage type care for pets as well and even offer pet first aid & CPR. Today almost all Southern California fire departments carry life saving equipment for pets, and as an organization were not stopping here. What can you do? You can contact your local Governor, this link is anther website that allows you to email your local State Senator; and send them a copy of Colorado's State Senator David Balmer's Bill SB-039, asking for a similar bill to be referred to committee. LegiScan is a service that allows you to check on the status of all bills, while AVMA (American Veterinary Medical Association) shows all updates in the United States in regards to pets. This is the first step in reposing a bill to become law. Change takes action, and one person can make a difference! Our organization is now worldwide and it was started by one human and one dog. :-) Take the appropriate steps and then ask tell your friends why your are starting this movement and what they can do to help. If you are aware of an state bill or educational system for Emergency Medical Services please contact us and let us know. We will add it to our public information to better help others that are out to make a change as well. For more information on how to make a difference your home town please visit us at this page!